AMD is aiming to break into the server market with its EPYC processors and while details are tight today we will be going over some third party benchmarks that were posted on SiSoft Sandra as well as leaked from German publications. The benchmarks were conducted in 1P mode as well as 2P mode (2x AMD EPYC 7601) and showcase the initial performance numbers that AMD has been working with. We will start with the leak from SiSoft Sandra which I presume was conducted by folks over at SuperMicro considering that’s the motherboard (SuperMicro H11DSU-iN) in use for this particular processor. The benchmark was run in 2P socket mode so you are looking at a total of 64 cores and 128 threads. The processor was able to deliver a peak performance of 1242 GFLOPs at a base clock speed of 2.2 GHz (2.7 GHz recorded for this particular benchmark). 2x AMD EPYC 7601 processors will also give you a media processing capability of 1348 MPix/s with multi-core efficiency at 236 GB/s. This is a pretty good score considering the MCM nature of the processor. 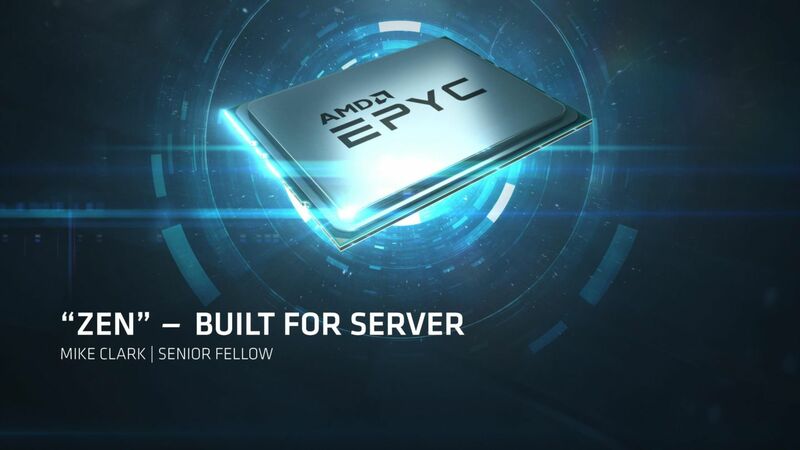 The AMD EPYC 7601 SiSoft Sandra entry can be found over here. Now Intel hasn’t announced a counterpart that has 32 cores. Their current generation server part with the highest threads is the Intel Platinum 8180 which has 28 cores. In 2P benchmarks (tested with the SuperMicro X11DAi-N SMC and TYAN S7106) we see the Intel Platinum 8180 delivering a peak performance of 1345.76 GFLOPs ( which is the highest public score currently available on SiSoft Sandra) with a net total of 56 Cores and 112 Threads running at 3.4 GHz. As far as the media processing capability goes, the 2P configuration delivers roughly 4855 MPix/s which is multiple times higher than AMD’s result. There could be two reasons for this: 1) either the benchmarks are not properly working on AMD EPYC or 2) the inter-core latencies between the EPYC dies are interfering with the highly demanding media encoding benchmark. The multi-core efficiency is at roughly 237 GB/s. The Intel Platinum 8180 SiSoft Sandra 2P entry can be found over here. You can find out more about the performance of Intel’s Platinum and Gold series over here. Up next we have the CInebench R15 performance numbers courtesy of Heise.de (thanks for the tip, Tejas). We dont have a screenshot this time around, but according to the source AMD’s EPYC 7601 processor nets approximately 6879 points in Cinebench R15 (Intel’s 8180 nets around 8301 points). They have also stated that they expect the LINPACK score to be roughly 2/3 of the Intel counterpart although they have not tested yet. 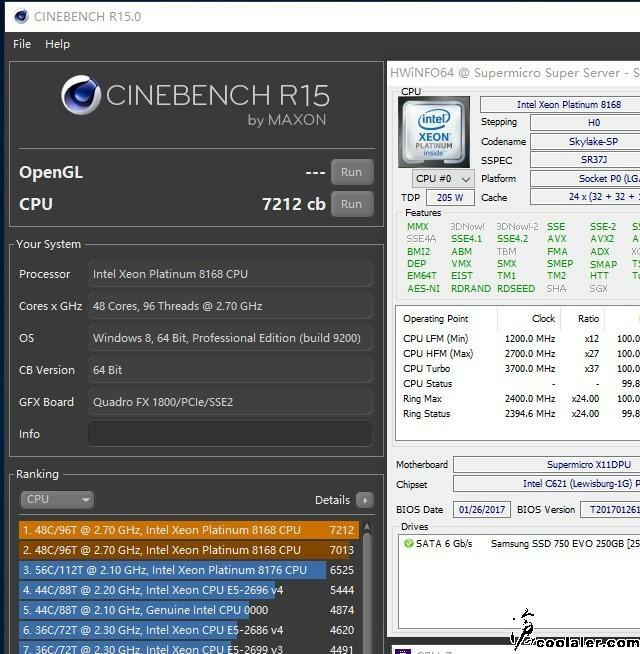 Cinebench score of the Intel Platinum 8168 2P which has 48 Cores / 96 Threads and scores higher than AMD’s EPYC 7601 according to Heise.de. All in all, AMD’s EPYC processors (especially the EPYC 7601) offer very solid (and definitely competitive) x86 performance in the server market. We have seen some slight hiccups in the performance tuning of these dies but since most of these are early samples given to AIBs like Supermicro for finalizing their motherboards, we can expect clock speeds to improve slightly which should have a significant affect on performance considering the core count (even the slightest performance change multiplied by 64 becomes a lot). We also previously heard that AMD is enjoying high yields with its Zen based dies. Firstly, the process they are using is the 14nm process which has had more than a year to completely mature and secondly, the die itself is quite small so yields will naturally be higher (conventional wisdom dictates that the smaller the die, the larger the yield). Since die size is one of the more significant factors in determining yield, I am sure that the company was well aware of this fact when it decided on the exact size. That said, however, the effect of these high yields can only have a positive effect for the company. Since the yields are above 80%, this means that the company will be able to increase in profits in two ways: either by decreasing the ASP (Average Selling Price) of the derivative products and shipping more volume and therefore larger profit, or, by simply increasing its profit margin on the products and keeping price the same. Looking at AMD’s core philosophy however, we may expect the silicon giant to go with the former approach and drop ASP all round. This means that products such as Naples which employ more than 1 core will also see a proportional ASP drop. AMD’s Zen architecture is all the rage these days and it turns out that the 4-core/8-thread Ryzen CPU is going to be 44mm². This is around 10% smaller than a comparable Skylake quad-core CPU which usually clocks in at 49mm². Not only is the Zen die size smaller than the Skylake variant, it is also able to pack in a larger L2 cache and L2 density, at 512KB and 1.5mm²/core respectively. In comparison, the comparable Skylake core only has 256 KB of L2 cache and a density of 0.9mm²/core. That said, a smaller die size does not equal a better processor, it simply means a more compact footprint.